This cake is famous. No really, it is. Okay, well maybe not world famous, but within our family and friend circle it is. This is my Mom’s hand-me-down recipe and she’s been making it for years. Just the smell of the cake baking reminds me of being in my Mom’s kitchen, or calling her over 10 times for the recipe because I kept losing it (don’t worry, I’ve got that covered now – it’s on my blog – I can’t lose it!). This cake shows up at birthdays, parties, special occasions or best of all, just because. CH and my brother have been known to ‘fight’ over this cake. In fact, one time my brother tried to hide the cake on CH, so that he wouldn’t have to share! [CH: He failed, then we decided to hide it from everyone else at the party and ate it all by ourselves. Flawless victory.] Apparently, it’s that good! This cake is so versatile too! It can be topped with a chocolate ganache, which makes it truly decadent. I also dust it with icing sugar (as shown) and serve it with ice cream. It also goes really well with strawberries and whipped cream. All I know is that leftovers are known to disappear for breakfast (actually, as I type this post….I just heard CH open the cake stand….I’m serious)! I know what you are thinking, it’s a pretty simple and basic cake recipe and it uses a cake box mix (*gasp*). 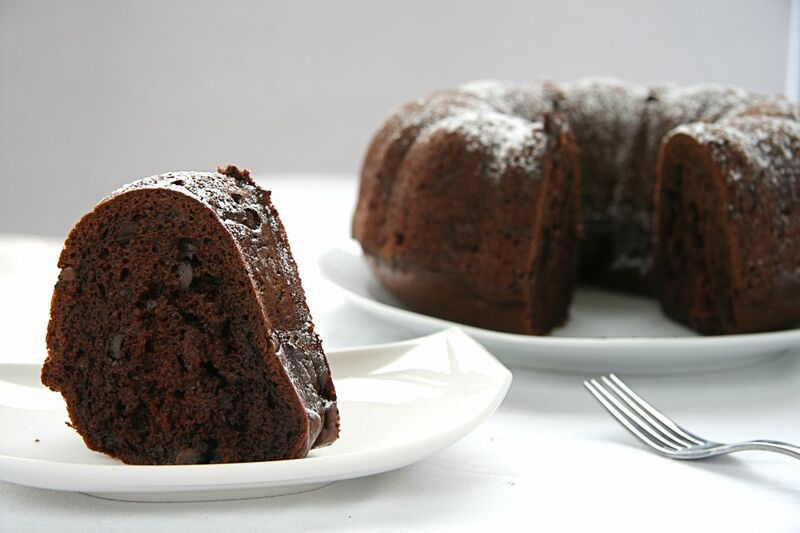 But, the say the proof is in the puddin, so try this cake soon. Grease a bunt pan with butter. Set aside. Preheat oven to 350 degrees. Using your KA stand-mixer, fitted with your flat beater, add in eggs, sour cream and oil. Mix well. Add in the cake mix and the pudding. Mix well again. Add in the 1/2 cup of water and give it one more good mix – until no clumps remain and the batter is smooth. Finally, toss in the chocolate chips and stir to combine. Pour cake batter into bunt pan and spread out evenly. Give the bunt pan a few taps on the counter to release any large air-bubbles. Remove from oven and let rest for 10 minutes. Flip over onto a rack and let cool entirely. *This cake can be prepared the day ahead and it still tastes as if you just baked it. 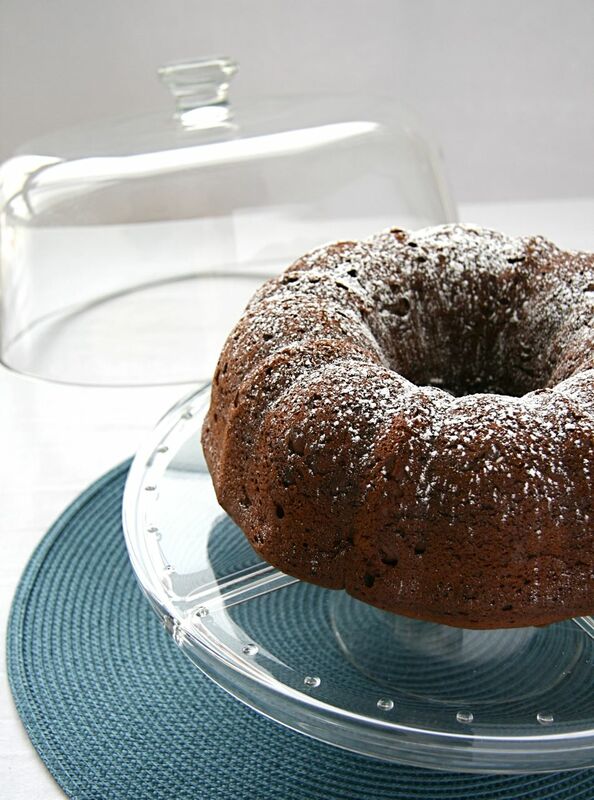 I leave mine overnight in my glass cake stand, but you can also place it on a plate and cover it with a plastic bowl. I will glaze it with the ganache about 30 minutes before serving. Place chocolate chips, half and half and butter in a small sauce pan. Over very low heat, melt until smooth consistency (I usually melt the mixture until there are still a few un-melted chocolate chips left. I then remove it from the heat and stir until all chips are completely smooth). Pour the hot ganache mixture over the cake and use a spatula to spread evenly. Let side for 20 – 30 minutes before serving (it’ll harden slightly, which is what you want! This recipe sounds delicious! What size package of instant pudding did you use? 3.4oz or 5.9oz box?